This girl is extremely sweet and loving. She reminds me of my favorite all time cat, her Aunt Ekatarina. Spayed, Vetted and Micro-Chipped with Lifetime Registration. Such a little flirt. Liza is a Love! Liza is spayed, fully vetted including rabies, and micro-chipped with lifetime registration. What a WONDERFUL kitty! This boy will "pour" out of your lap then turn around and play like he has endless energy. Best of both worlds. He would be so much fun to show and would probably do great. This boy is fully vetted, Neutered, Rabies and Micro-chipped with a Lifetime Registration. Fully vetted, neutered, and micro chipped. These boys are so beautiful and so sweet. They got their mom and dads super loving and gentle nature. They also got their beautiful conformation and size and amazing coats. Both could also be shown. Fully vetted, neutered and micro chipped with lifetime registration. Fully vetted, neutered, and micro chipped with lifetime registration. Olivia is a 18 month old who is overwhelmed by all the other kitties running crazy. She has developed into a beautiful, fluffy kitten with a full triple coat. She is so affectionate but will jump down as soon as another cat want my lap. She will probably need a little patience while she gets comfortable in her new home. She has been with dogs and other cats but I think she would prefer a lower population home where she can thrive. She will surely end up like her brother BOO BOO who was such a pest cuz he wanted loving all the time! Olivia is spayed, vetted and microchipped with a paid lifetime registration. He has the most amazing sweet disposition, too. 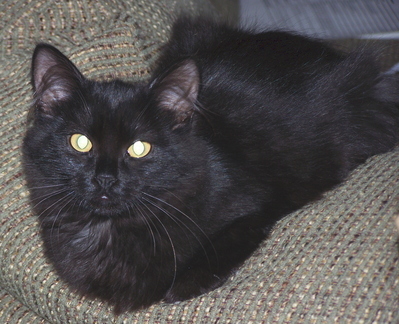 Misha born 9-9-12 was originally reserved for the breeding program but he is now living with his forever family. "Billy is the best cat we have ever had. Thanks for raising such a good kitty... -Jim." Boo Boo Playing... So Cute! "BOO BOO" is such a sweet heart.